The remains of this Augustinain complex are one of the best examples of a medieval nunnery left in Britain. It was established around 1200 by Reginald, son of Somerled, ‘King of the Isles’, and first run by his sister Bethoc. 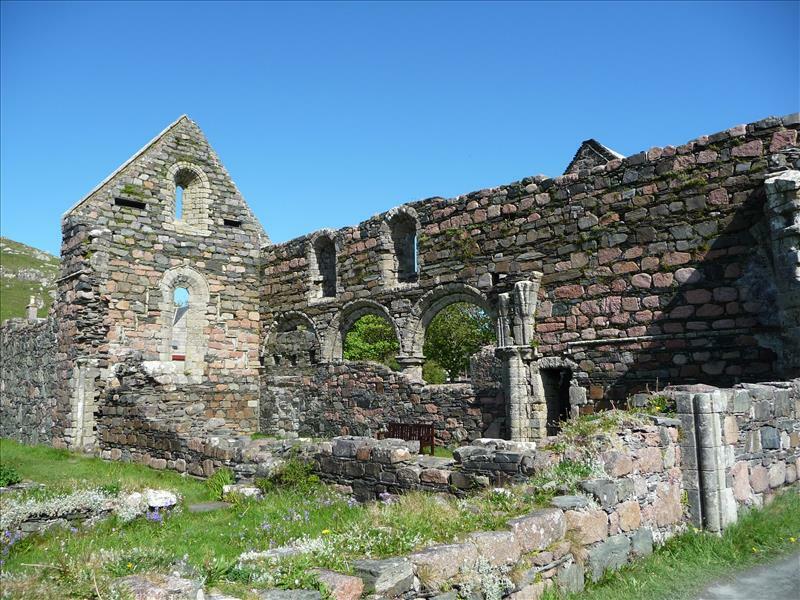 Unlike Iona Abbey, the nunnery was not rebuilt after the deconstruction during the Reformation. The nunnery church occupied the north range of the nunnery and today is probably one of its best preserved areas. Much of it dates from the 13th century. One end wall and one side wall are largely intact, along with the north transept, which now forms the only ‘enclosed’ space in the nunnery. The church has a chancel and a nave with a three-bay aisle on the north, and a small chapel at the east end of the aisle. The chancel and north chapel have rib-vaulted ceilings, and a fine triangular-headed window can be seen in the north chapel. The capitals of the nave arcade are adorned with fine carved work. 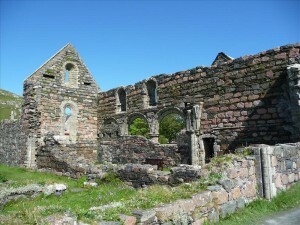 The nave would have been available for use by pilgrims to Iona. The chancel was used by the nuns themselves for their round of services. The cloister is ruinous, but sections of the east and south ranges still remain. It is now maintained as a garden with a few benches where visitors can sit and enjoy the peaceful setting. Three rooms are still discernible along the east range and the chapter house was the central one of these. The south range comprised the refectory and kitchen. Little more than the foundations of the cloister arcade now remains. It was enlarged to south and west in the 15th century. Beautifully carved fragments from the cloister are on display in the neighbouring Teampull Rònain (St Ronan’s Chapel). The nuns led a contemplative and cloistered life, and followed the teaching of St Augustine of Hippo, in Egypt. They wore black habits, and, as a result, their church was locally called an eaglais dhubh (‘the black church’). The nunnery was popular as a place to which ladies of noble birth retired and preferred to be buried. A graveslab in Teampull Rònain bears the inscription: ‘Here lie Finnguala and Mariota MacInolly, sometime nuns of Iona’. The badly damaged graveslab of Prioress Anna MacLean (died 1543) can be seen in the chancel. Clearly visible under her outer robe is the ‘rochet’, a pleated surplice denoting the Augustinian Order.